Major pressure pumping companies in Texas and Pennsylvania were experiencing issues with their safety relief valves. They ran into the issue of pop-off valves not re-seating properly in the field and not holding an acceptable tolerance. Oseco developed a new high pressure reverse buckling rupture disc to withstand the harsh environment of hydraulic fracturing. The Oseco Safety Plug will withstand hundreds of hours of field service with zero maintenance required. Pressure pumping companies are now installing the Oseco Safety Plug on their high pressure lines as well the fluid ends on pumps to protect their people and equipment from costly overpressure events. 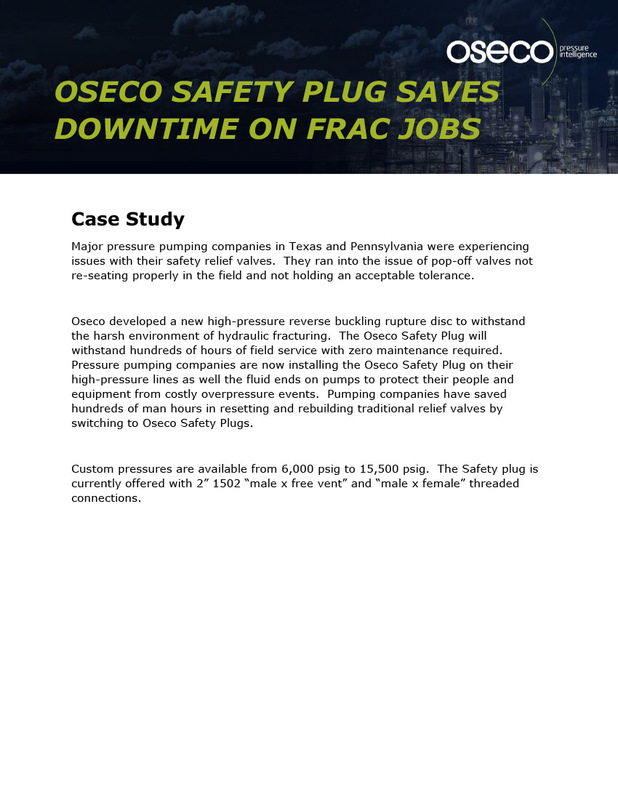 Pumping companies have saved hundreds of man hours in resetting and rebuilding traditional relief valves by switching to Oseco Safety Plugs. Custom pressures are available from 6,000 psig to 15,500 psig. The Safety plug is currently offered with 2” 1502 “male x free vent” and “male x female” threaded connections.